Playing Antichamber is a test of patience. Its clever puzzles and abstract, Escher-like environment perplex at every turn. Conventional logic does not apply here, the sterile scenery continuously subverting expectations and rules before introducing more to follow. It perplexes and dumbfounds you at every turn, causing more than a few colorful exclamations after some of the weirder and sudden transitions. It’s all almost enough to make your head spin, trying to keep everything straight. But therein lies the brilliance of Antichamber. Its abstract nature is key to creating extremely devious puzzles. Key to erecting a mind-bending place to explore. Key to creating a completely non-linear experience that almost encourages you to break the apparent linear events of your first play-through. Antichamber is a puzzle through and through, and one of the most fun to solve. You begin in a wireframe room. A map, a mural of various signs you’ll find throughout the facility, and a window looking out into a small hallway decorate the area. Outside, three doors stand: two at opposite ends of the small hall, and one labeled “exit” – your destination. Getting there, however, isn’t easy. These balls tend to freak out when you’re around. 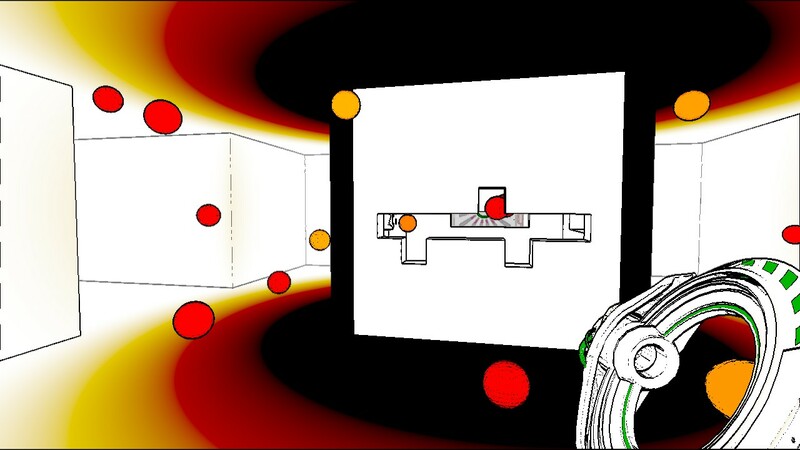 The sterile world of Antichamber is a volatile one. Floors give way, corridors de-materialize, windows act as literal portals. What would be of standard architecture in any other game becomes something to be always wary of, taking note of where you’re dropped off and from where constantly, building a mental map of the facility. Your own survey of the area is key, for you’ll be backtracking a lot. Antichamber has no one way forward. It’s a series of branching paths that end either in dead-ends or puzzles – the only thing stopping you being your ability to learn Antichamber’s concepts and logic quickly, for puzzles are thrown at you relentlessly. Each uses colored blocks found throughout for various application, be that opening doors or helping you get around via makeshift staircases. Sounds simple on paper, but becomes maddeningly complex in execution. In part because most aren’t able to be solved without the proper equipment. Meaning you can bang your head against a single problem only to realize you lack the right gun. Guns allow manipulation of the aforementioned blocks. Finding them is as much a puzzle as the rest of the game. There are four in all – all carrying a different primary color. The functions of each are different. The first will only be able to pick up and place blocks one at a time, while the rest will be able to operate blocks in increasingly advanced ways. Their abilities are demonstrated immediately upon collection. The game becomes steadily easier with each upgrade because the new functions trivialize some of the parameters. But mostly it’s due to how adept you become with all the mechanics. What were once impossible roadblocks devolve into but elaborate door switches as solutions begin clicking instantly, although only for a short while. Doesn’t take long for another perplexing room to introduce a new idea to or two, once more spurring a drastic change in how you perceive the environment. That large black mass appears all over the place. But what is it? Antichamber is always finding new ways to stump you. Skills are regularly introduced and discarded, rarely using the same conceit twice. Approaches evolve and revert at will as the nature of each puzzle begins to reveal themselves. It’s a game where keeping all the ideas, concepts, and skills you’ve learned in place is difficult. You’re taught so much over the course of Antichamber’s strange journey. It’s easy to forget techniques that can make puzzles easier and faster or more daunting and challenging, as there’s never one clear path or solution. And that’s the genius of it. Every play-through could ultimately be very dissimilar to your last, whether it be through uncovering new chambers or means to proceed with without the proper gun. 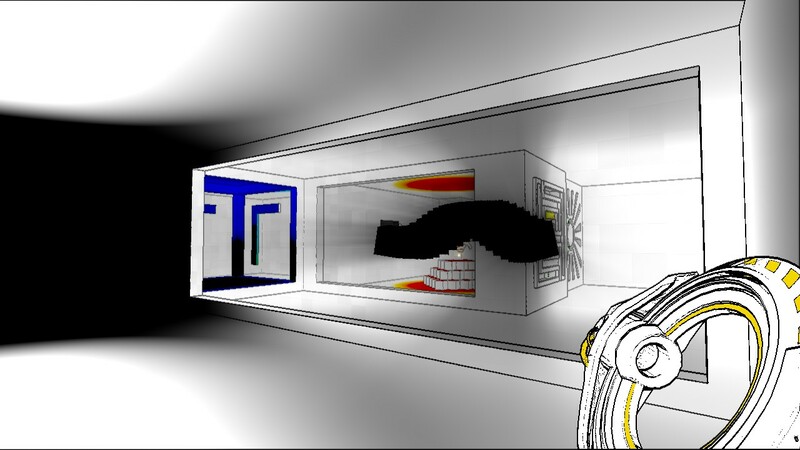 Antichamber is an enigma in the truest sense, and a satisfying one to unwrap.